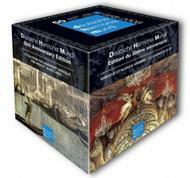 The set contains 50 classic recordings of baroque and ancient music, chosen to represent the breadth of this huge and varied catalogue and each disc is slip-cased with artwork replicating the original CD or LP artwork. Included is a booklet with a detailed history of the label and its artists. It is half a century since Rudolf Ruby founded the label deutsche harmonia mundi in Freiburg. DHM, as it is known, enjoys a reputation primarily as an early music label, but if the label�s entire catalogue as preserved in DHM�s archives is examined, its sheer variety is amazing, for here we find very different aspects of deutsche harmonia mundi: in addition to the vast array of early music, there are also many contemporary works: music by Berg, Webern, Boulez, Hindemith, Messiaen and Rihm, to name but a few. The company made its first recordings with artists of the stature of J�rg Demus, Elly Ameling, Paul Badura-Skoda, the Deller Consort and Gustav Leonhardt, all of whom increasingly left their mark on the label�s public profile. Among the early music specialists who continued to join the ranks of deutsche harmonia mundi are Andreas Staier, Les Adieux, Konrad Jungh�nel and his Cantus C�lln, Musica Fiata, Camerata K�ln and La Stagione. The Freiburg Baroque Orchestra under Thomas Hengelbrock joined the label�s roster of artists as representatives of the very youngest generation of performers. New faces from the early music scene were soon in evidence: Al Ayre Espa�ol under Eduardo L�pez Banzo produced an impressive series of releases of Spanish Baroque music, Andrew Lawrence King and his Harp Consort continued to explore an equally unknown but valuable repertory. Thomas Hengelbrock then founded his Balthasar Neumann Choir and Ensemble, with which he undertook a number of extremely interesting and musically ravishing projects. And it is surely significant that Nikolaus Harnoncourt is once again playing an important role with deutsche harmonia mundi, a conductor who is one of the great names on the early music scene and who likewise undertook important pioneering work in this field during the early days of the Freiburg-based label.